Resilience is the ability to be prepared for adversity and better handle life’s challenges. Resilience is a skill that can be learned. 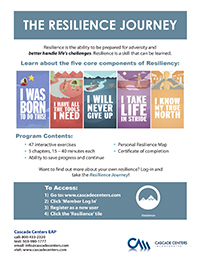 Want to find out more about your own resilience? Log-in and take the Resilience Journey!